I picked this book up on a recent trip to the Gila National Forest in New Mexico. We stopped by the visitor’s center for the Gila Cliff Dwellings, and it just caught my eye; what can I say? I think it was the subtitle, Emil W. Haury and the Mogollon Controversy. I casually find archaeology as intriguing as the next person does, although it’s never been a serious interest; but the idea (as expressed on the back cover) of a controversy over whether a people deserve to be recognized as unto themselves, with their own accomplishments and culture, definitely appealed to me. First of all, I appreciated the Preface, wherein the authors explain their personal connection to Haury (a teacher and mentor), their interest in the Mongollon question, and what they intend with this book. This is not to be a biography of Haury, but his story coincides heavily with the one they will be telling. I like to hear from authors (of nonfiction, anyway) what they’re up to like this. Reid & Whittlesey do a fine job of completing their stated task. After reading this short (~150 pages) but dense book, I feel fairly well-versed (you know, for an amateur) in the Mogollon controversy and the players involved. In a nutshell, Emil Haury was a young and gifted archeologist who, in the 1930’s, discovered artifacts in the southwest United States (Arizona and New Mexico) that did not fit into the contemporary understanding of the two cultures then known to have inhabited those parts: Anasazi and Hohokam. He postulated that he had discovered evidence of a distinct culture which he named after the mountains where he was working: Mogollon. The archeological community was immediately up in arms over a few key issues, namely, whether the Mogollon were indeed a distinct and different group, and whether they were as ancient as Haury believed. There was also some question of their eventual fate: were they assimilated into the Anasazi culture, or did they continue to exist as a morphed but still individual culture, past 1000 AD? 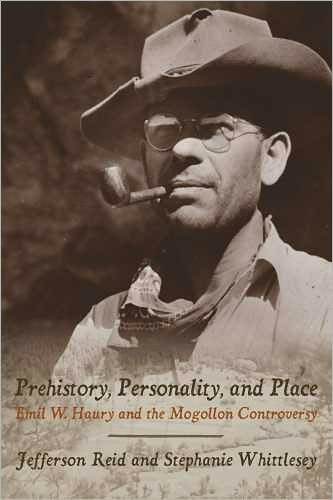 Haury would spend the rest of his life and career working to validate the existence, antiquity, and distinctiveness of the Mogollon, while also investigating other cultures (there is tangential reference to the apparently significant-in-its-own-right Hohokam controversy), establishing field schools, and teaching. He seems to have been a remarkable man. By the mid-1960’s, the controversy was all but entirely resolved, more or less in favor of Haury’s initial theories. There were other important players as well, of course, and we meet many of them on both sides of the controversy; but Reid & Whittlesey make an excellent argument for the strength of Haury’s personality and his academic authority playing a key role in the decades-long discussion. Which brings me back to the title of the book. This book is about the Mogollon controversy, yes, but it is also about the relationship between personality, place, and the study of archeology (or prehistory, or anthropology, or – I venture to extend the concept – the study of most social disciplines). Reid & Whittlesey demonstrate how Haury’s personality was a key player, and also how the places that formed and influenced him – his birthplace in the wide-open Kansas plains to the striking vistas of the southwest – played their own roles in the drama. I found their arguments about personality and place convincing and appealing. The archeology, and the questions (and relatively few answers) about prehistoric peoples, were mildly interesting to me; but I was definitely more engrossed by the drama of academic minds in debate. That was the more accessible human-interest story, if you follow. I continue to have questions about that debate, in particular its partisan nature. it seemed to me that there were really two “schools” of thought, and they follow the lines of literal schools of study so remarkably that I felt sure this was not a coincidence. In other words, it struck me not as a difference of intellectual interpretations of data, but of two groups of people pitted against each other. The archeologists who had helped establish our understanding of the Anasazi were invested in keeping that culture supreme in prehistory; they resisted the idea that there may have been other players in the same (or earlier) time, like they were rooting for their own dog in the fight. It’s a shame to think that these men (they were mostly men) were inserting personal feelings and alliances into the study of science. But that’s humanity for you, I suppose. For the record, this understanding, of the personal rather than scientific nature of the controversy, is mine, and not the authors’. I thought this was a well-executed and informative book, and I recommend it, but be aware: it’s a little dense and academic for the general audience. I understand that it was intended for the general public, and I do think it works (I had no prior expertise, certainly) but it took a little extra effort, so bear that in mind. I’m glad I picked up a total unknown, and I enjoyed it. For another general-audience book on antiquity & archeology, you might be interested in my review of Tutankhamen: The Search for an Egyptian King by Joyce Tyldesley.